.STL - is a common file format for volumetric 3D models used in the 3D Printing. It stands for STereoLithography; one of the first methods in 3D printing invented. STLs are what are fed into the Voxel8 Dashboard cloud based software to generate GCode. ABS FILAMENT - a common thermoplastic material known for its strength and industrial properties for 3D printing. It typically requires a heated bed as found on the Voxel8 Printer. BED LEVELING - the process of getting the build plate calibrated with the FFF print nozzle such so that layers deposited during the printing process are precise and accurate in location in the Z-axis direction. BED/BUILD PLATE - This is the general area where 3D prints are deposited. It is located underneath the x,y gantry where the two extruders are kept. It is removable and magnetically placed. It is also kinematically coupled. The build plate can also be heated up to 100C which allows for printing of ABS filament material in addition to PLA. BLUE TAPE - Blue Painter's tape is a common material that comes in the Voxel8 Developer's kit as a roll. It provides an excellent printing surface that is applied directly to the build plate. It can be purchased from any hardware store. After a number of prints, it should be removed and replaced with a new layer when it shows signs of wear, or you have problems with parts adhering to the surface. BRIDGING - when you 3D print an object with a air gap underneath that spans a significant distance. With thermoplastic this is doable for short distances. For very short distances you might be to do this with silver as well. However, you successful results may vary depending on your design. BUILD PLATFORM - the area under the gantry where your 3D printed objects appear. The build plate sits on top of the build platform. CARTRIDGE HOLDER - this is the container that holds the dual extruders for both thermoplastic extrusion and silver conductive trace extrusion. COOLING FAN - that fan that cools the thermoplastic material that is output from the left hot end extruder of the Voxel8 Printer. COMPRESSED AIR TUBE - the clear red tinted air tube that connects from the air pump to the silver extrusion system in the back of the Voxel8 Printer. DRIVE GEAR - the internal mechanism that grips and pulls the filament through the heated extruder to 3D print materials. This should be free and clear of debris during operation. ETHERNET PORT - Located on the backside of the Voxel8 Printer. This provides internet access to/from the machine. It takes a standard RJ45 cable. EUCLID - the custom 3D Printing slicer engine that Voxel8 has developed custom for delivering multi-material prints. It is currently based off the Julia programming language. EXTRUDER - the mechanical assembly on the Voxel8 printer that pulls the thermoplastic filament from the filament spool bay, heats and melts the plastic, and then pushes the material through the nozzle onto the build plate (i.e. "extrusion"). EXTRUDER FAN - the fan that keeps the FFF extruder cool during operation. FFF - Fused Filament Fabrication is a term coined by the RepRap project members to describe the process of heating, melting, and extruding plastic thermoplastic filament for extruding it in 3D Printing. FFF NOZZLE - The end tip attached to the FFF extruder which allows heating plastic to flow out during printing operation. It is covered over by a silicone attachment that prevents it from contacting nozzle metal on the build plate metal. FILAMENT GUIDE TUBE - the clear plastic tube that runs from the filament bay underneath. FILAMENT GUIDE TUBE MOUNT - the top of the FFF extruder has a plastic guide that feeds the clear plastic filament guide tube into the extruder head at an optimal angle. FILAMENT SPOOL BAY HOLDER - the area underneath the build plate on the bottom half of the machine where you insert your filament spool for dispensing thermoplastic material. FIRMWARE - the software that runs directly on the electronics of the Voxel8 Printer machine. GANTRY - comprised of the metal rods that make up the x and y axis on the Voxel8 Printer and allows movement in those directions through stepper motors. The gantry also houses the dual extruders inside the cartridge holder inside the build platform area. GCODE - the low level instructional codes that tells the Voxel8 Printer to perform very specific mechanically actions such as moving up, down, left, right, as well as other sophisticated actions (e.g. extrude plastic). Gcode is a very common, and legacy CNC programming language for controlling manufacturing machines. HOOD - The acrylic plastic lid that opens and closes on the top of the Voxel8 Printer. It is currently actuated by hydraulic pumps on each side of the printer. It should be closed during machine operation. LASER DISTANCE SENSOR - is a laser profilometer device that allows extremely accurate measurements (i.e. within 10 um) from the Voxel8 printer in the z-axis. This allows for full alignment of both material nozzles in XY and Z space, as well as assists in auto bed leveling, and potential future use cases. The laser is located in the gantry section, close to the two extruders in the carttridge holder area. PLA FILAMENT - This is the thermoplastic material that ships on a spool with your Voxel8 printer. The diameter of the material is 1.75mm. PNEUMATIC PUMP - the pressurized air pump that pushes Voxel8 silver material out of the syringe cartridges and onto the build plate for 3D printing electronics. It is located underneath the machine, but you should not have to access it during normal machine operation. The regular inside the pump allows for adustments of pressures during prints, and auto-calibration of material flow rates. PNEUMAUTIC SLED - on the back right side of the printer. You should not need to remove this. It contains a pump, reservoir and other pnemautic components required to dispense the silver trace from the Voxel8 Printer. POWER SLED - on the back left side of the printer where the power switch resides. You should not need to remove this. SILVER ALIGNMENT - the procedure that makes sure that both the FFF extruder and the Silver extruder are properly calibrated and leveled before mult-material prints can be done. SILVER INK - the conductive silver ink that is contained in silver cartridges. This consumable material is made custom by Voxel8 and is available for purchase. SILVER LEVER - the lever that flips during silver extrusion on the side of the right volume. It is currently mechanically activated left and right which makes the Silver nozzle extend and retract when dispensing silver conductive ink in prints. SILICON SLEEVE - The small silicon sleeve that covers the hot end extruder that protects the nozzle from any collisions. SILVER NOZZLE - The tip of the right extrusion head, typically red in color that dispenses the silver conductive ink on the Voxel8 Printer. These should be replaced regularly before each print, and especially during the silver alignment procedure. SLICING - the action of taking a 3D model and converting it into slices, which are represented ultimately by gcode run on the Voxel8 Printer. SWAPPABLE CARTRIDGE SYSTEM - the extruder heads that fit into the Voxel8 gantry are swappable. This means that they may be removed and new printing cartridges can be inserted to print additional materials. Due to this feature, the Voxel8 Platform is set to be extendable in the future to serve more materials that what ships with it initially. TOUCH PANEL - the 5" interactive color touch display screen on the front of the Voxel8 Printer which allows operators to print and monitor their jobs on the hardware if they are away from the Voxel8 Control Interface on their computer. USB CABLE - an optional cable that connects your Voxel8 Control Interface on a computer to the Voxel8 Printer hardware. You may also run the Voxel8 printer through ethernet, or wirelelessly. VOXEL8 CONTROL INTERFACE - based on the open source OctoPrint user interface; this is the piece of onboard software within the Voxel8 Printer which controls the printer hardware. VOXEL8 DASHBOARD - the cloud-based software that allows operators to convert .STL files into gcode for Voxel8 Printing. VOXEL8 DEVELOPER'S KIT - the name of the encompassing Voxel8 first generation Printing Platform. It consists of not only the printer hardware, but also software, materials, and support. 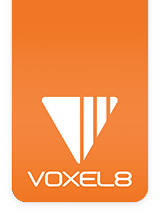 VOXEL8 SILVER SYINGE - the syringe cartridge that contains the silver conductive ink. The syringes come capped to prevent the material from dying out. WIRELESS ANTENNA - In addition to the ethernet port, the Voxel8 printer also supports built in WiFi. WIPING TOWER - The small pyramid shaped printed object that accompanies your multi-material prints. It is used to keep conductive silver ink flowing during print operation. It also helps wipe away away excess silver or plastic that builds up on the nozzles during a print job. Z-AXIS ROD - The long threaded rod seated in the back of the Voxel8 Printer that allows the build plate to rise and fall during 3D printing operations.